Pablo de Hita y Salazar (1646–date of death unknown) was a Spanish military officer who served as governor of Spanish Florida (La Florida) from 1675 to 1680. The territory at the time stretched from current-day Florida west to Texas and north to South Carolina. He was best known for his work devoted to construction of the Castillo de San Marcos in St. Augustine, the capital of La Florida. Hita y Salazar was born about 1646 in Seville, Spain. 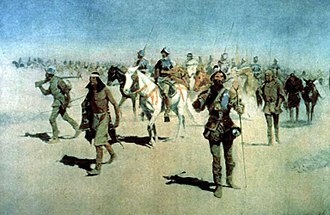 Hita y Salazar joined the Spanish army as a youth, serving in Flanders, Germany, Mexico and in the Cambray War over the course of forty years. He attained the rank of Sargento mayor (Sergeant major). In 1670, Hita y Salazar moved with his wife and six children to Veracruz, where from 1670 to 1674 he was chief administrative officer, or corregidor, of Veracruz. He served in the military until May 3, 1675, the year in which the Spanish Crown chose him to become the new governor of Florida. Hita y Salazar's performance at San Juan de Ulúa and his experience in the Flanders war led to this appointment as Governor of Florida. Hita y Salazar also organized the construction of the port of San Juan de Ulloa. When Hita y Salazar was 29 years old, he left Sevilla and moved to Florida. Once he became governor, plans were made to construct a new masonry fortress, the Castillo de San Marcos, to replace the series of wooden structures that had previously defended the presidio. During that time, the Florida government under Hita y Salazar made further changes and reforms in the plans for the castle's construction. Although it was Manuel de Cendoya who began the construction of Castillo de San Marcos, it was Hita y Salazar who consolidated the final draft: dimensions of the square, placement of fortification elements, polvorines and soldier houses. 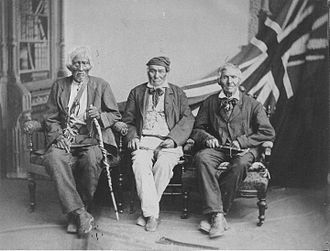 The workers were primarily recruited Native Americans from the area. Hita y Salazar recommended (following the military engineering concepts in vogue) that the fort be made in a pentagonal shape (the same as the fort of San Diego, in Acapulco, Mexico), although the idea was rejected by his advisers. On July 30, Hita y Salazar heard that another fortress was being created, and thought that it was unnecessary. 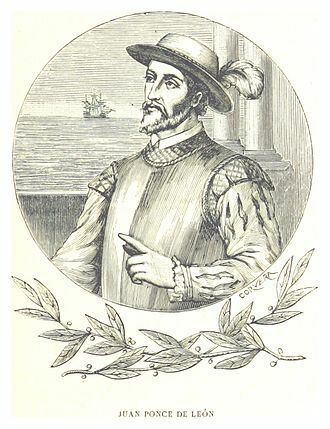 Hita y Salazar sent two letters to the Crown in which he explained the progress made at the Castillo de San Marcos and made suggestions for construction of the fort. He also explained that he thought any attacker who arrived in St. Augustine would try to conquer it and hold Anastasia Island, cutting off resupply fleets and bombarding the castle. To protect the island and prevent an invasion, Hita y Salazar decided that its engineers should build a four-armed redoubt, to be placed on the coast near the El Pinillo inlet (which no longer exists) of the Matanzas River, guarding access to St. Augustine. It seemed that many of Hita y Salazar's decisions may have been influenced by a false idea that there was an army on Anastasia Island that could bombard the castle and cut off supply lines. There was no army there, however. 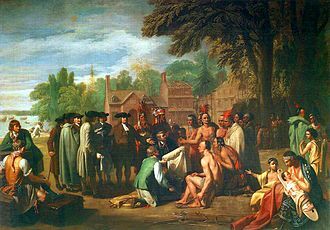 He withdrew his theory of the invasion of the island, but in 1739 the British general James Oglethorpe did exactly what Hita y Salazar had described. The supply ships were prepared for the attack, and the castle was able to prevent the few cannonballs that were sent by Oglethorpe. Blocks and others elements (such as the Coquina rock) with which the castle was built, blocked the impact of the cannonballs. Consequently, the bombardment was ineffective. Hita y Salazar sent a plane to the Viceroy of New Spain, Payo Enríquez de Rivera, explaining the state the Fort was in and that his advance, foundations, tanks and bastions that were being built. Hita y Salazar, apparently, had reached economic and technical problems in certain parts of the work. The accounts and expenses always exceeded the budgeted amount. He faced an inquest in 1678, but came out unscathed. Hita y Salazar ordered the construction of a battery in front of the castle to protect the deck and the pier. This was so that transport activities carried out by the ships would remain in force during the duration of the attack. All these changes would be paid by the defenses expense. When Hita y Salazar came to west Florida, he decided he could make a wall of defense to prevent a military attack by replacing the wall with a real stone wall. This idea showed, at least to his staff, that he did not understand the fabrication of a fortification, which prompted them to send a letter to the Spanish Crown criticizing him. Before the Spanish crown had sent a response, Hita y Salazar made a decision to stop all construction on the fort. This interruption of the construction was rejected by many people in St. Augustine. 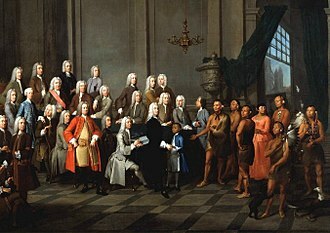 On May 8, 1676, the staff of Hita y Salazar sent another letter to the Crown complaining about the plans of their superior. The Crown decided that he should not make these changes and that he was not competent enough for this position because, according to him, the Royal politics - including those linked to the construction of Castillo de San Marcos - was more important than the ideas of a simple soldier in the army, since he had no experience in construction. Hita y Salazar warned the Crown of the need to stay with the original plans. On October 14, 1676, the Real Accounts sent another letter to the crown that indicated a long list of expenses, changes and delays made by the Governor Hita y Salazar, including the wages paid to workers, even when they had done nothing significant. 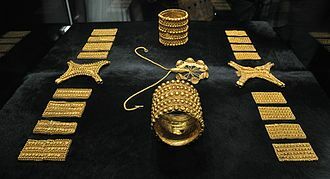 On July 3, 1679, the reply from the Crown arrived, indicating that the construction should follow the original construction plans. The following year, on September 28, 1680, when the walls were nearly finished, and the pit was finished, including the embankment (although the officials in charge of the work said that the project still needed four more years and an expenditure of eighty thousand pesos), Hita y Salazar was suspended from office as governor of Florida. On November 30, of that year, with the arrival of the new governor of the province, Juan Márquez Cabrera, Hita y Salazar gave him a report that included a detailed outline of the progress made by in the city up until that time. In this report, he explained the many changes he made in the castle (which he considered insufficient) and included the plans of Apalache, Guale and San Marcos, as references on what he had done. None of these changes corresponded to the original plans, which meant that he had rejected the orders of the Crown in the construction of the castle. Governor Cabrera made a series of investigations that concluded the numbers of materials and structures carried out in St. Augustine by Hita y Salazar, and those that he indicated to have done in the castle. The reports did not coincide. 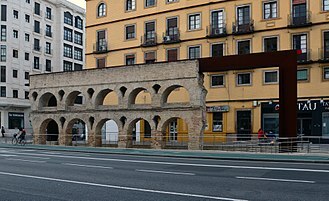 Cabrera's engineers found many errors in the structures that Hita y Salazar had ordered to be built, especially some walls and bastions which were unstable because their bases were incomplete. One side of the bastion of San Carlos had to be completely rebuilt, as the wall was uneven. The former Governor Hita y Salazar blamed the discrepancy on his engineer, Lajon Lorenzo, who he said had provided him the data to produce these pieces. Construction on the castle continued until 1695, and cost tons of gold. In 1695, the walls were 26 meters high and were effective in the siege of 1702, keeping the whole population of the city in a fortress surrounded by 300 soldiers. After two months, the fort was broken. Hita y Salazar was not only dedicated to building fortifications to prevent British attacks on Florida. 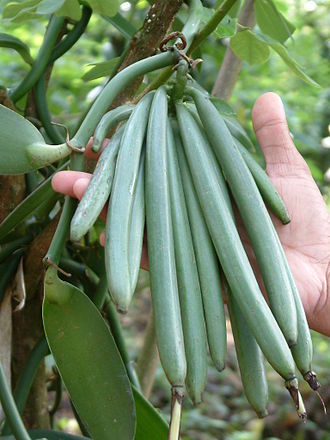 He also gave a boost to the livestock, distributing land to his friends, the criollos of the province. Hita y Salazar was instrumental in developing cattle breeding in the area. He decided to establish himself as a farmer and lived in Saint Augustine and in 1680, had a house built that still exists in the city. In 1679, while Hita y Salazar was dedicated to the construction of Castillo de San Marcos (and as part of the Spanish colonial expansion in the northwestern Florida area), the construction of a fort at San Marcos de Apalache, in St. Marks, Florida began. It was built to prevent external attacks against the colony. The fort was initially built of wood, coated with mud, and acted as a wooden stockade. It remained this way for three years. Because of his military career, he knew about fortifications and had probably read the treaties of Adam Freitag (L'Architecture militaire ou la fortification nouvelle), David Papillon, and Matthias Dogen that contained the experiences of military fortification in Flanders, as well as the books of Prieto Floriani, the books of the Jesuit, Jean Dubreuil, Sieur de Bitainvieu, and Pagan Lein's work Fortifications. All were published in the seventeenth century and highlight the relationship between the population and the fort. Hita y Salazar married Juana de Ávila (née Ruíz) and they had six children: Gerónimo Fernando, Catalina, Juan Antonio, Pablo Domingo, Gerónima, and Pedro Francisco Hita y Salazar. Hita y Salazar is related to Venezuelan media mogul, Gustavo Cisneros, through his paternal branch of the family. ^ a b "Descendants of Pablo de Hita Salazar" (PDF). Cuban Genealogy Club of Miami, FL. 2007. Archived from the original (PDF) on 21 July 2011. ^ a b c d e f g h i j Simón, Luis Arnal (1999). "Tercera parte: El fuerte de la piedra y la villa = Part Three: The fort of the stone and the town". Arquitectura y urbanismo del septentrion novohispano (in Spanish). 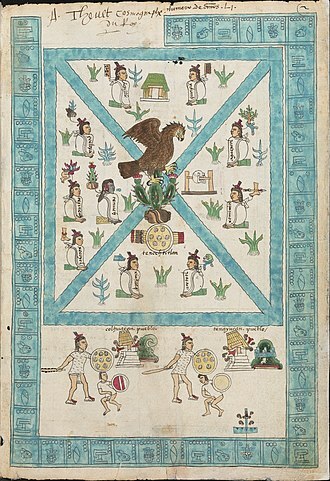 Volume 2: Fundaciones en la Florida y el seno mexicano, siglos XVI al XVIII. México, D. F.: Universidad Nacional Autónoma de México, Dirección General de Apoyo al Personal Académico, Facultad de Arquitectura, Coordinación de Publicaciones. pp. 97, 99, 169. ISBN 978-9-683-67436-4. OCLC 427451739. ^ Mº Massip, José (22 June 1955). 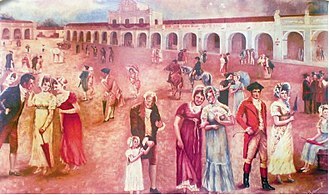 "San Agustin de Florida, la ciudad encantada = Saint Augustine, the haunted city". ABC de Sevilla (in Spanish). p. 11. ^ a b c d e Bridges, Tony. "Hita y Salazar and the Castillo de San Marcos". Tony Bridges. Archived from the original on 23 March 2012. ^ Suárez Fernandez, Luis; Ramos Pérez, Demetrio; Lohmann Villena, Guillermo (1984). "Chapter E. Las Antillas y la Florida en su época de internacionalización; 5. La Real Hacienda". Historia General de España y América. 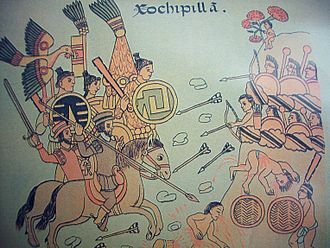 T. 9,2, América en El Siglo XVII: Evolución de los reinos indianos = Americas in the Seventeenth Century: The Evolution of the Kingdoms Indians (in Spanish). Tomo IX-2 (Segunda ed.). Madrid: Ediciones Rialp, S.A. p. 224. ISBN 978-8-432-12104-3. OCLC 63718118. ^ Cox, Dale (10 May 2015). 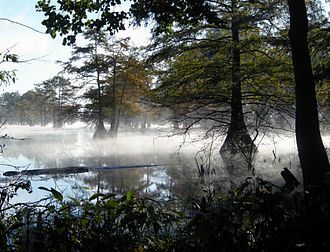 "San Marcos de Apalache Historic State Park - St. Marks, Florida". Explore Southern History. ^ a b Spencer, Rojas (18 January 2007). "Pablo de Hita y Salazar" (Genealogy). RojasSpencer.com. ^ "Undergraduate Commencement 5PM - from Undergraduate Commencement: Business Administration and Engineering" (Livestream video). University of Miami. 12 May 2017. 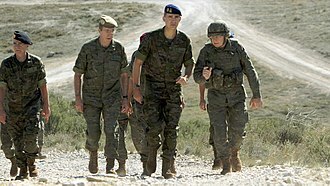 Jimenez II, Mariano; Jiménez, Mariano G. (1 January 2007). "San Agustín. Castillo de San Marcos: San Agustín: Caminando sin rumbo = San Augustine, walking aimlessly". Caminando sin rumbo (in Spanish). It is divided in 212 municipalities and its capital city is Xalapa-Enríquez. This state is located in Eastern Mexico and it is bordered by the states of Tamaulipas to the north, San Luis Potosí and Hidalgo to the west, Puebla to the southwest and Chiapas to the south, and Tabasco to the southeast. On its east, Veracruz has a significant share of the coastline of the Gulf of Mexico, the state is noted for its mixed ethnic and indigenous populations. Its cuisine reflects the cultural influences that have come through the state because of the importance of the port of Veracruz. In addition to the city, the states largest cities include Veracruz, Coatzacoalcos, Córdoba, Minatitlán, Poza Rica, Boca Del Río. The full name of the state is Veracruz de Ignacio de la Llave, Veracruz was named after the city of Veracruz, which was originally called the Villa Rica de la Vera Cruz. The suffix is in honor of Ignacio de la Llave y Segura Zevallos, the state’s seal was authorized by the state legislature in 1954, adapting the one used for the port of Veracruz and created by the Spanish in the early 16th century. 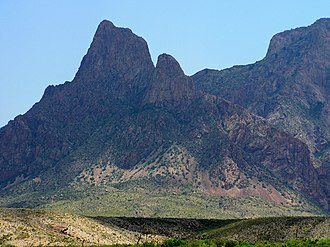 The state is a strip of land wedged between the Sierra Madre Oriental to the west and the Gulf of Mexico to the east. Its total area is 78,815 km2, accounting for about 3. 7% of Mexico’s total territory and it stretches about 650 km north to south, but its width varies from between 212 km to 36 km, with an average of about 100 km in width. Veracruz shares common borders with the states of Tamaulipas and Chiapas, and Puebla, Veracruz has 690 km of coastline with the Gulf of Mexico. The topography changes drastically, rising from the coastal plains to the highlands of the eastern Sierra Madre. Elevation varies from sea level to the Pico de Orizaba, Mexico’s highest peak at 5,636 m above sea level, the coast consists of low sandy strips interspersed with tidewater streams and lagoons. Most of the coastline is narrow and sandy with unstable dunes, small shifting lagoons. 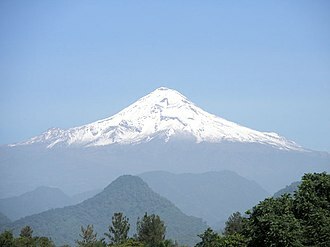 The mountains are of the Sierra Madre Oriental and the Trans-Mexican Volcanic Belt, major peaks include Pico de Orizaba, Cofre de Perote, Cerro de Tecomates, Cerro del Vigía Alta and Cerro de 3 Tortas. The Castillo de San Marcos is the oldest masonry fort in the continental United States. Located on the shore of Matanzas Bay in the city of St. Augustine, Florida. Construction began in 1672,107 years after the founding by Spanish Admiral and conquistador Pedro Menéndez de Avilés. The forts construction was ordered by Governor Francisco de la Guerra y de la Vega after the raid of the English privateer Robert Searles in 1668. Work proceeded under the administration of Guerras successor, Manuel de Cendoya in 1671, the construction of the core of the current fortress was completed in 1695, though it would undergo many alterations and renovations over the centuries. The fort was declared a National Monument in 1924, and after 251 years of continuous military possession, was deactivated in 1933, the 20. 48-acre site was turned over to the United States National Park Service. In 1942 the original name Castillo de San Marcos, was restored by an Act of Congress, Castillo de San Marcos was twice besieged, first by English colonial forces led by Carolina Colony Governor James Moore in 1702, and by Georgia colonial Governor James Oglethorpe in 1740. The Native American art form known as Ledger Art had its origins at the fort during the imprisonment of members of the Plains tribes such as Howling Wolf of the southern Cheyenne. The European city of St. Augustine was founded by the admiral Pedro Menéndez de Avilés for the Spanish Crown in 1565 on the site of a former Native American village called Seloy. Over the next century, the Spanish built nine wooden forts for the defense of the town in various locations, the need for fortifications was recognized after it was attacked by Sir Francis Drake and his fleet of 22 ships in 1586. Following the 1668 attack of the English pirate Robert Searle, Queen Regent of Spain, the Castillo is a masonry star fort made of a stone called coquina, made of ancient shells that have bonded together to form a type of stone similar to limestone. Workers were brought in from Havana, Cuba, to construct the fort in addition to Native American laborers. The coquina was quarried from the Kings Quarry on Anastasia Island in what is today Anastasia State Park across Matanzas Bay from the Castillo, construction began on October 2,1672 and lasted twenty-three years, with completion in 1695. St. Augustine is a city in the Southeastern United States, on the Atlantic coast in northeastern Florida. It is the oldest continuously occupied European-established settlement within the borders of the continental United States, the county seat of St. Johns County, it is part of Floridas First Coast region and the Jacksonville metropolitan area. According to the 2010 census, the city population was 12,975, the United States Census Bureaus 2013 estimate of the citys population was 13,679, while the urban area had a population of 69,173 in 2012. Saint Augustine was founded on September 8,1565, by Spanish admiral Pedro Menéndez de Avilés, Floridas first governor. He named the settlement San Agustín, as his ships bearing settlers and supplies from Spain had first sighted land in Florida eleven days earlier on August 28, the feast day of St. Augustine. 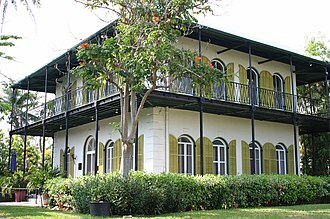 The city served as the capital of Spanish Florida for over 200 years, since the late 19th century, St. Augustines distinct historical character has made the city a major tourist attraction, and it is the headquarters for the Florida National Guard. Founded in 1565 by the Spanish conquistador, Pedro Menéndez de Avilés, in 1562, a group of Huguenots led by Jean Ribault arrived in Spanish Florida to establish a colony in the territory claimed by Spain. They explored the mouth of the St. Johns River, calling it la Rivière de Mai, sailed northward, Spain learned of this French expedition through its spies at ports on the Atlantic coast of France. The Huguenot nobleman René de Laudonnière, who had participated in the expedition and he arrived at the mouth of the River May on June 22,1564, sailed up it a few miles, and founded Fort Caroline. He was ordered as well to drive away any intruders who were not subjects of the Spanish crown. On July 28, Menéndez set sail from Cádiz with a led by his 600-ton flagship, the San Pelayo, accompanied by several smaller ships, and carrying over 1,000 sailors, soldiers. On the feast day of St. Augustine, August 28, Menéndez sailed north and confronted Ribaults fleet outside the bar of the River May in a brief skirmish. 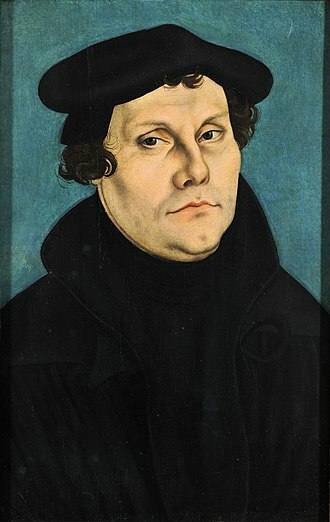 On September 6, he returned to the site of his first landfall, naming it after the Catholic saint, disembarked his troops, and quickly constructed fortifications to protect his people and supplies. 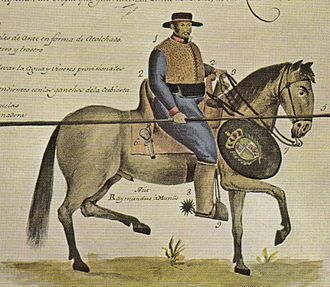 Menéndez marched his soldiers overland for an attack on Fort Caroline. 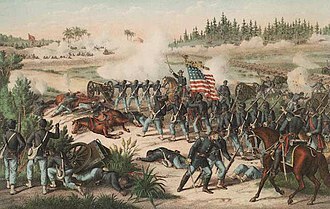 Jean Ribault had already put out to sea with his ships for an assault on St. Augustine, there they were confronted by the Spaniard and his men on the opposite side. After several parleys with the Spanish, Jean Ribault and the Frenchmen with him surrendered, almost all of them were executed in the dunes near the inlet, in 1572, the settlement was relocated to the mainland, in the area just south of the future town plaza. Confident that he had fulfilled the conditions of his contract with the King, including the building of forts along the coast of La Florida. 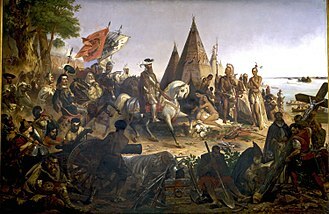 After several more transatlantic crossings, Menéndez fell ill and died on September 17,1574, succeeding governors of the province maintained a peaceful coexistence with the local Native Americans, allowing the isolated outpost of St. The War of the League of Cambrai, sometimes known as the War of the Holy League and by several other names, was a major conflict in the Italian Wars. Although the League was initially successful, friction between Julius and Louis caused it to collapse by 1510, Julius allied himself with Venice against France. In the aftermath of the First Italian War, Pope Alexander VI had, with French assistance, in 1507, Julius returned to the question of the cities in Venetian hands, once again rebuffed by the Senate, he encouraged Emperor Maximilian I to attack the Republic. Julius, humiliated by the failure of the Imperial invasion, turned to Louis XII of France with an offer of alliance. On 10 December 1508, representatives of the Papacy, France, on 15 April 1509, Louis left Milan at the head of a French army and moved rapidly into Venetian territory. Consequently, when Louis crossed the Adda River in early May and Alviano advanced to him, believing it best to avoid a pitched battle. Alviano, disregarding the new orders, continued the engagement, his army was surrounded and destroyed. DEste, having joined the League and been appointed Gonfalonier on 19 April, the newly arrived Imperial governors, quickly proved to be unpopular. In mid-July, the citizens of Padua, aided by detachments of Venetian cavalry under the command of the proveditor Andrea Gritti, the landsknechts garrisoning the city were too few in number to mount effective resistance, and Padua was restored to Venetian control on 17 July 1509. The success of the revolt finally pushed Maximilian into action, in early August, a massive Imperial army, accompanied by bodies of French and Spanish troops, set out from Trento into the Veneto. In mid-November, Pitigliano returned to the offensive, Venetian troops easily defeated the remaining Imperial forces, capturing Vicenza, Feltre, although a subsequent attack on Verona failed, Pitigliano destroyed a Papal army under Francesco II of Gonzaga in the process. 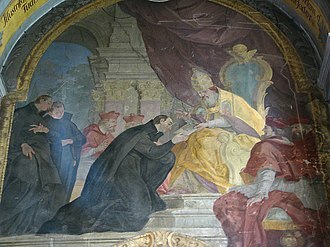 Francesco Guicciardini credited the victory to Alfonso himself. A new French advance soon forced Pitigliano to withdraw to Padua once again, faced with a shortage of both funds and men, the Senate decided to send an embassy to Julius in order to negotiate a settlement. Aerial view photo taken from northwest. Although the fort had a water-filled moat at the time, it was originally a dry moat. View of the Plaza de Armas within Castillo de San Marcos. Statue of James Oglethorpe at the Augusta Common, an open space he personally designed when co-founding the city in 1735. One of the small remaining portions of the stone wall of the Spanish fort, San Marcos de Apalache. UNAM's robotic team with Steve Wozniak at the 2017 Robocup in Japan. Pope Julius II, painted by Raphael (oil on wood, c. 1511). Julius attempted to secure Papal authority in Italy by creating the League of Cambrai, an alliance aimed at curbing Venetian power. 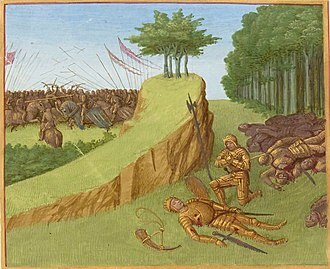 The death of Gaston de Foix during the Battle of Ravenna heralded a long period of defeats for France. Vendôme Tower in Marsaxlokk. 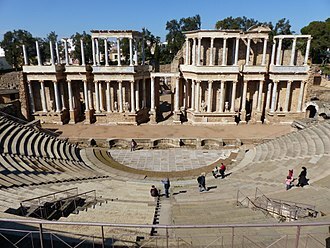 It is the only surviving tour-reduit in Malta. St. Augustine Lighthouse on Anastasia Island. Original Anastasia Island lighthouse, now destroyed. Lower parts of the coquina tower dated to the First Spanish Period.